Type Locality: "sylvis Europæ frigidæ" restricted by Thomas (1911a) to "Northern Sweden." Pasitschniak-Arts, M. 1993. Ursus arctos. Mammalian Species 439: 1–10. PDF. Ursus arctos in Mammal Species of the World. 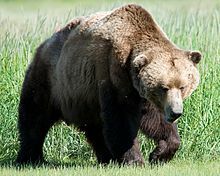 For more multimedia, look at Ursus arctos on Wikimedia Commons. This page was last edited on 21 March 2019, at 01:37.